Now that I have found my storage boxes of choice, an alternative to sortimo sorting boxes, I needed to build a rack to store them. I really like the rack that sortimo came up with as a storage solution. However I don’t have that much floorspace in my shop and I wanted my racks to be as cheap as possible, so I turned to my scrap wood pile and found a few pieces of 3/4 inch plywood to build it out of. To save space I hung it on French cleats so it wouldn’t sit on the floor and I could put it anywhere in my shop. 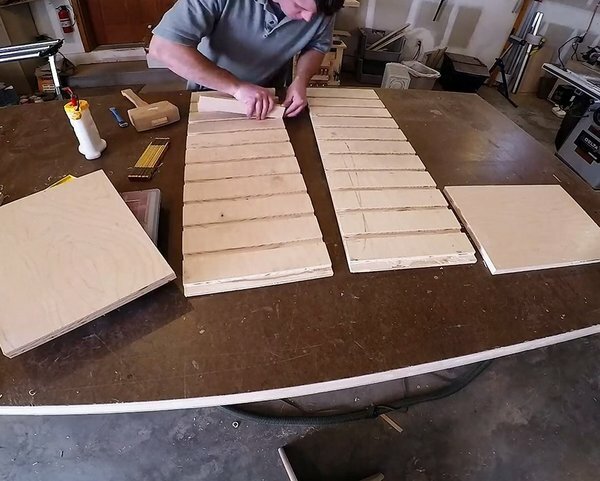 I started out cutting some dado’s in the sides for the shelves to fit in. I left the plywood oversized and waited until I had all the dado’s cut until I separated the two halves. This way I would be insured that the dadoes would line up and the cabinet would be square. 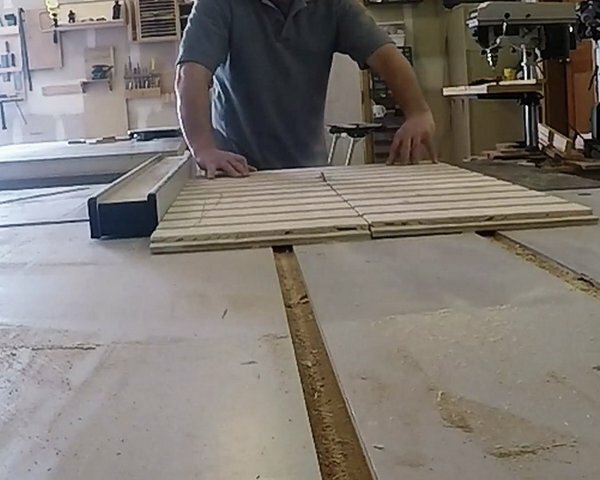 Plywood is a pain to cut dadoes in because there is always some kind of warp or cup in the sheet that causes it to ride high in places over the dado blade. This causes an inconsistent depth in the dado and will cause the joint not to fit properly and throw the cabinet out of square. To solve this I used my Router Plane to make all the dado’s a uniform depth. This is one of my favorite hand tools to use. 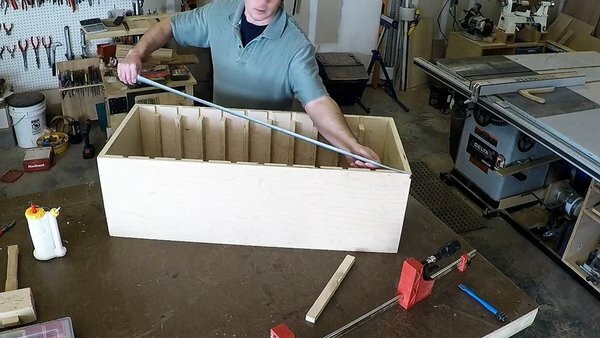 I cut some plywood strips about 2” wide and glued and nailed them into the dadoes to act as support boards to hold the sorting boxes in the rack. I didn’t use shelves for two reasons. 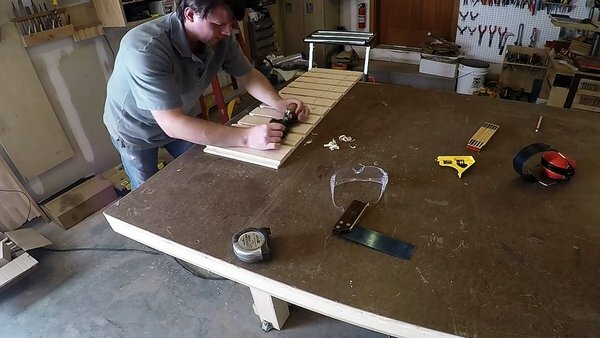 Mainly because I would have to go buy more plywood to span the entire cabinet, using more material, and as a side benefit, if there are no shelves, there is no place for dust and clutter to accumulate. Forcing me to put my tools away when done, instead of cramming them onto cluttered shelves getting in the way of what is supposed to go on that shelf. 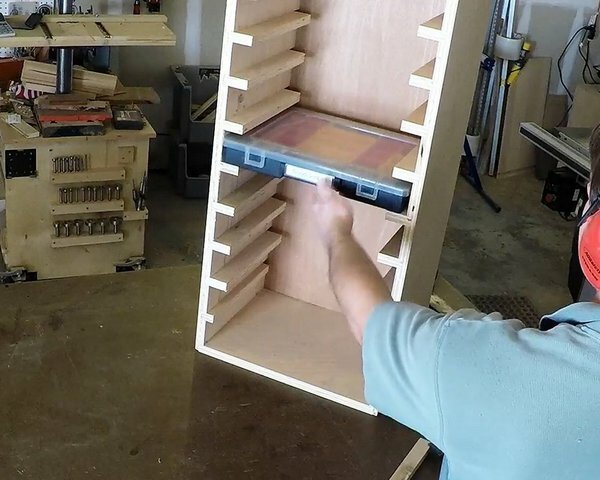 Attaching the bottom and the top was straightforward cabinet building. 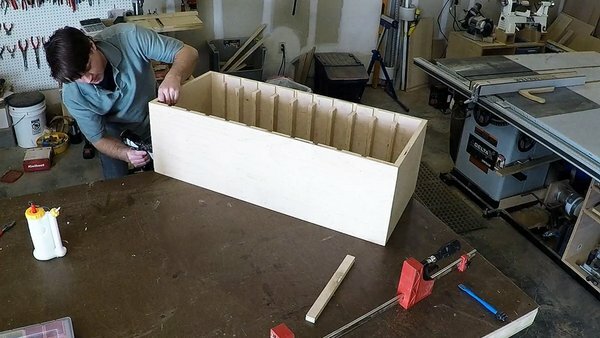 I had cut rabbets into the top and bottom edges of the side panels, and then glued and nailed the top and bottom pieces of plywood into them. Before attaching the back I checked for square by measuring the diagonals of the cabinet, and it was dead on. However due to the number and close proximity of the dadoes the sides bowed in just a little. To fix this, when I attached the back I turned one of my quick release clamps around and used it to push outward pressure on the sides until they were straight. The back panel held the sides in place when I nailed it on. All in all it turned out pretty good, holds all my storage bin boxes, and leaves me room to add a few more. If I left out anything in this post, you may be able to catch it in this video.